Home Answering religious questions	Deuteronomy 18:18, does it refer to Muhammad or Jesus? 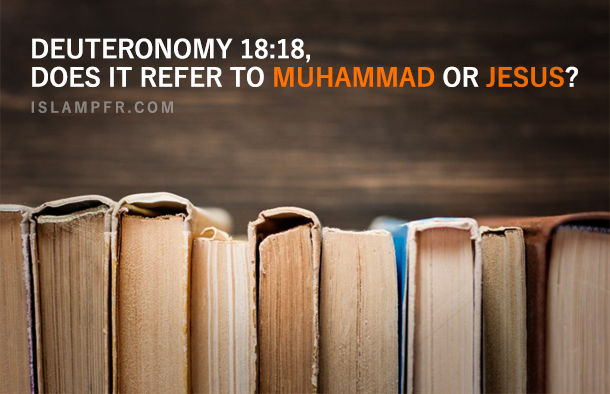 Deuteronomy 18:18, does it refer to Muhammad or Jesus? Deuteronomy 18:18, Muslims say it refers to Muhammad (PBUH) and Christians say it refers to Jesus (PBUH), which one is true? I will raise up a prophet for them from among their brothers, like you (Moses), and I will place my words in his mouth; and he shall speak to them all that I shall command him. Muslims say this verse refers to the Prophet Muhammad (PBUH). The question is, if this description doesn’t refer to Muhammad (PBUH), who is this prophet? Jesus (PBUH)? Abraham (PBUH) had two sons from Hagar and Sarah, Ishmael and Isaac (PBUH) (Genesis 21). Ishmael (PBUH) became the grandfather of the Arab nation, and Isaac (PBUH) became the grandfather of the Jewish nation. The prophet spoken of, was not to come from among the Jews themselves, but from their brothers, i.e. the Ishmaelite. Muhammad (PBUH) is from the descendant of Ishmael. Kedar also is his ancestor. When Ishmael is brother of Isaac, so Ishmaelite (Arab nation) is brother of Israelite (Jewish nation). If the word “their brothers” (Deuteronomy 18:18) refers to Israelite themselves, why God didn’t say “among you” or “among Israelites”? Israelites had hundreds prophet, which one is this prophet? When God sent to Israelites hundreds prophet, why He should say such a prophecy just about one of them?! During the lifetime of the prophet Muhammad (PBUH) and under his supervision, these words were then memorized and written down by his companions. But when he, the spirit of the truth, comes, he will guide you into all the truth. He will not speak on his own; he will speak only what he hears, and he will tell you what is yet to come. The Quran is the only holy book starts with the statement: in the name of God. Indeed 113 chapters out of 114 begin with the phrase “In the name of God, the most gracious, the most merciful”. Even the chapter, which does not start with the exact statement, chapter 9, do have the word “Allah (God)” at the very first line. Isaiah relates the messenger to Kedar who will sing a new song (a scripture in a new language), Isaiah 42:10-11. The Quran was revealed in sections over a span of 23 years in different locations and occasions. This, the very last statement, shows that God will send rules and laws that require people to obey them. No book can compete with the Quran in perfection of divine laws and rules. Can Gospel be another candidate? By examining the Gospels we know that they do not pass the criteria of Deuteronomy 18:18. The Gospel do not bring new laws because Jesus (PBUH) did not come to do so but to revive the laws of Moses (PBUH). He was to establish the laws of Moses (Matthew 5:17). Although it did not work out because people rejected him. His mission was not to tell people what to do and what not to do, because people already knew those from the Old Testament. Jesus (PBUH) was simply reminding them the laws of Moses (PBUH). Is Imam Ali’s name in the Quran?